My grandfather was an airplane mechanic in the Pacific during WWII. He had a long career in the power industry as a machinist after that. Listening to all the stories he would tell of the airplanes, battles, and the kind of work that a man’s man does, he did have one regret – not taking better care of his hearing. His frustration was evident as my grandmother would often have to repeat herself and nearly shout to be heard at times. For some, hearing protection is an OSHA requirement that can be a nagging annoyance at best. For others, it’s a vital component to ensuring quality of life after the job is done. We teamed up with DeWalt and Radians to take a closer look at hearing protection with a pair of products at different levels. Radians makes DeWalt’s PPE equipment along with Black & Decker and several other name brands you might recognize. While we’re focused on hearing protection in this article, they also make safety glasses, gloves, boots, and more. We’ll be looking to bring in a couple of other products to talk about their quality and style later on. The number to remember with PPE hearing protection is NRR – Noise Reduction Rating. The DeWalt Interrupter Ear Defender carries an NRR of 23. The DeWalt Interceptor Folding Earmuff carries a 29 rating. So what does this actually mean? 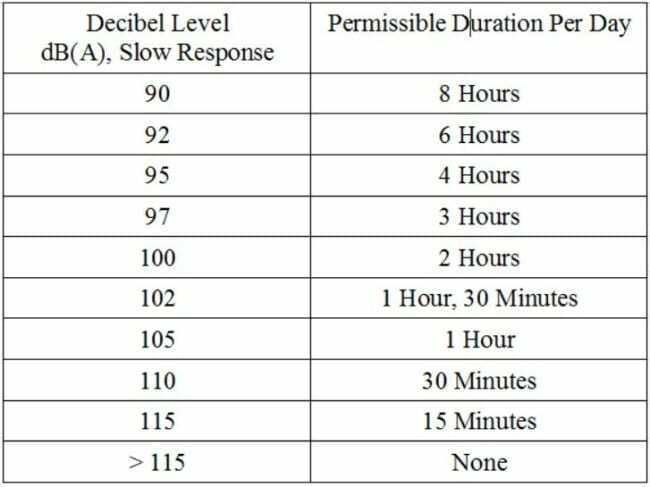 Let’s take a look at our two test subjects, then jump into a better understanding of the decibel system and how it affect the jobsite. A basic and inexpensive earmuff, the DeWalt Interrupter features a padded headband that helps keep pressure off of your noggin. The ear covers can rotate 360 degrees for a comfortable fit. The muffs slide to accommodate different size heads. If the head band is bothersome, you can rotate it right off the back of your head while still leaving the muffs securely in place. This is also great when you’re wearing a cap or helmet. I often deal with pressure points and headaches associated with the pressure on other earmuffs I’ve used. The simplistic design of the Interrupter hasn’t given me that issue so far. I’m going to keep my fingers crossed that this continues. At an NRR of 23, the DeWalt Interrupter is an excellent choice for lawn maintenance and most outdoor tool use. Indoors, where sound bounces and can be magnified, you’re still good with most hand held and bench top tools. In industrial environments, you may need to look at an increased NRR rating to meet OSHA requirements for your job. DeWalt’s Interceptor model earmuff is a more comfortable option that offers an NRR of 29. It doesn’t put as much pressure around your ears while still creating a solid sound buffering seal. These don’t rotate the way the headband does on the Interrupter, but the folding muffs still slide to allow for plenty of head sizes. Fortunately for those of us living in Florida (and anyone else who sweats), there is a moisture-wicking pad on the headband. When the job is done, they fold up to a very compact size. This makes carrying and storing the Interceptor easier when space is limited. The maximum NRR runs up to 30, so the rating of 29 puts the Interceptor very near the top. With noise reduction that high, it’s acceptable for nearly every application, including as hearing protection on the gun range. Like I mentioned before, you’ll just want to be sure that it doesn’t dampen sound so much that it’s unsafe. Noise Reduction Rating is the number of decibels you can expect to reduce surrounding noise when using the product. A Google search of “decibels” can offer a confusing set of science geek wonderland, so let me see if I can make it a little easier to understand. There are really two things to consider with decibels – sound intensity (or acoustic power) and perceived loudness. For athletes, this is kind of like the difference between heart rate (actual effort level: sound intensity) and perceived effort (how hard the effort feels: perceived loudness). With the decibel system, sound intensity doubles every 3 decibels and reaches a multiple of 10 every 10 decibels. If you graph it, it’s not linear – it’s an exponential curve. Here’s a couple of quick examples. 63 decibels has double the sound intensity of 60 decibels. 66 decibels has four times the sound intensity of 60 decibels and double the intensity of 63 decibels. 70 decibels has ten times the sound intensity of 60 decibels. When it comes to perceived loudness, that doubles every 10 decibels. So 70 decibels sounds twice as loud as 60. Jump up another level to 80 decibels and it now sounds four times as loud as 60. Does it really matter which earmuffs you choose? Yes, the implications are huge when it comes to our friends over at OSHA. According to OSHA, you can work for up to 8 hours at a noise level of 90 dBA. On the other end of the scale, you can only be exposed to 115 dBA for 15 minutes or less. By using hearing protection with an NRR of 25 or higher, you can work around 115 dBA equipment for 8 hours instead of 15 minutes. Anything less will limit how much time you can work. Looking at the chart, you can see that just a few decibels really changes how long you can work in a given environment. When you’re in charge, choosing the correct hearing protection for yourself and your employees directly impacts how productive you can be. Is an NRR of 29 really that much better than 23? It’s only 6 decibels! When we look at the NRR of the two earmuffs, the dBA difference is 6. In terms of sound intensity, the DeWalt Interceptor (NRR 29, right) reduces the power 4x greater than the Interrupter (NRR 23, left). Even thought the perceived loudness is not even twice as loud on the Interrupter, the actual pressure difference on your ear drums is significant. Is a larger NRR always better? A larger NRR will always indicate better noise reduction – but it’s not always the best bet. Take a professional lawn maintenance crew. They may only need to reduce the noise by 10 – 15 decibels. However, reducing it down 29 decibels may not allow them to hear the car coming before they step into the street. So it’s a balance between getting the equipment noise down to OSHA acceptable levels while allowing enough noise in to effectively and safely do the job. Good clear article, but checking a few other brands might help workers even more. Some years ago, I covered a similar subject for a print magazine, and found some ease of use with various in-the-ear plugs, as well as the MM muffs. There was also a pair of muffs that had a sound canceling feature using music, IIRC.